I'd like to introduce myself to members of the forum. My screen name, "21stCenturyThinker" is not meant to imply that I'm some sort of modern philosopher. More to imply that I've lived my political life on auto-pilot as I made my way through my Army career and raised my family. It's time for me to think, to wake up and become a part of the discussion. 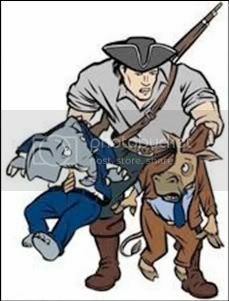 Simply voting Republican every four years is no longer enough, given the attacks on liberty that we are now sustaining. Attacks launched by our own President. How did I get to this site? A friend sent me an e-mail with a reference to President Obama's answer to high gasoline prices: "buy a hybrid". I hardly believed it could be true that a sitting President could show that level of contempt to an American. And get away with it. The first I heard of the remark was this morning, a full year after the event. I know I've been asleep, but I didn't think I was dead- how did I miss the equivalent of Marie Antionette's "let them eat cake" (remember, she had her head cut off for that one)? How could our supreme commander get away with something like that? So I realize now that I was part of the problem. I also realize that I don't have to change everything myself and that it's OK just to be a part of the ground swell movement that will hopefully win back our government and protect our civil rights. I have lived in a lot of places during my Army career. Europe, Middle East, Far East, South Pacific... I know that we Americans still have far greater freedom than any other nation. But we are in danger of giving it all away. I am convinced that the liberals are trying to sell us all into servitude. There are no rights without responsibility and the left would give up all our rights (not just their own!) to relieve themselves of all responsibility. We can't allow that. We all need to stand up together and yell (figuratively, for now) that we are not going to accept a monarchy in the place of democracy, serfdom in the place of freedom, slavery instead of personal responsibility. Add my voice to the shout of my brothers and sisters in liberty. Welcome to the forum 21CT. Dive in anywhere, and let us know if we can offer any assistance. Welcome aboard 21CT, another ally in the fight against tyranny is always welcome! Welcome, 21stCenturyThinker, you'll find no autopilots here. look forward to your input and participation. Thanks to you all for the welcome. I hope you can help me find my way a little bit. Like a man who just woke up from a long sleep, I'm not sure what's next. What does an active Republican do these days? I went to the caucuses last month and got elected Precinct Chairman. I want to be a good one. I'm hoping "It's About Liberty" will help educate me about what my fellow Republicans are concerned about. Any advice? Good on you for becoming a precinct chairman. The political avenues have no hope of succeeding without conservatives in those positions within the GOP. The best information I have seen about turning the position of GOP precinct committeeman into conservative action is from member "Cold Warrior" at www.redstate.com. Look at RedState for his name, and you will always find info on working the process from the inside. Here is a quick youtube search of "Cold Warrior Precinct". Look here and you'll find him among the results of the search. Thanks for the tips, my friend. I'll go over there soon and have a look. For now I'll stick around this site and see how my opinions compare with those of my fellow conservatives. Great to have you in the forum. Also, thank you for your service. ...For now I'll stick around this site and see how my opinions compare with those of my fellow conservatives. Well, I can tell you that we have variety of thought here, but we are as universal as we can be in our recognition of the threat posed by Leftism. We are the ones the Leftists and the fearful Republicans call "extremists". You know, Tea Partiers. In other words, political correctness holds no sway here, we speak openly and honestly about the issues we discuss, and we are suspicious of Republicans who claim conservatism but fear recrimination from the Left for being conservative. Most of us instinctively pull in the opposite direction - or push, depending on ones perspective. Welcome aboard, 21CT! If you read some of our views and find yours differ, don't be afraid to speak up. We always enjoy a lively debate. Hard to do that wilth a lib. My brother won a precinct committee seat but I didn't fare so well. They're not called the "good ol boys" party for nothing - what I'm hearing is that the mechanisms by which anything is accomplished are stratified to the point where progress happens at a glacial pace. I'm anxious to hear from others (you!) whether or not you find this to be true in your area. I too slumbered for the longest time, trying to do the right things for myself and my family, but not really getting involved beyond voting (at least I did that reliably!). I still remember my older brother telling me that the clinton election signaled "the end of the world as we know it". I guess in some ways he was right - if maybe a bit hyperbolic. By the time 9/11 took place I was reading a lot and sending out feelers around the web looking for like-minded people. That's how I wound up in the company of these fine folks. I've been involved in a couple of local election campaigns and have a loose business partnership with one of the local GOP "big shots". That gives me access to our local "inner circle" where I routinely remind them of the parable of The Emperor's New Clothes (and, in the case of our state chairman, The Princess And The Pea). Welcome to No-Doze Land. Roll up your sleeves and have at it . . .